I went to the annual MVP Conference in February, and had a really good time, as usual. It is great to see so many people who give their time and expertise for free in all areas of technology, but the highlight for me (besides the skiing on the Saturday) has to be meeting with the Visio product team for two days. We really feel that they listen to us, and we like to hear what they might be considering for the future. I presented my take on the forthcoming validation API in Visio 2010 Premium (did I mention I am writing a book about it? ), and others presented their areas of interest. One bit of Visio that stood out was the potential of Visio Services with SharePoint 2010. Obviously the Microsoft Visio team were excited about this, and the Visio MVPs are relishing it too, but what about the rest of the world? Well, I think the message is getting out … hopefully Visio will no longer be Microsoft’s best kept secret! I think that SharePoint (and web) developers will now see how compelling data-linked diagrams are, and hopefully will demand more and better Visio diagrams. Microsoft are moving Visio into the Business Intelligence division now (which is where I always thought it should be anyway). We Visio developers have got to embrace this wave, or we will get over-looked, and others will attempt to produce visualizations without the richness that we could offer. To this end, I have managed to create a dual boot laptop with Windows 7 and Windows 2008 R2 Server which has SharePoint 2010 with Visio Services, so that I can explore the possibilities opened up by this new Visio SharePoint integration, and I will be presenting some of which I discover at the Microsoft TechDays in April (see http://www.microsoft.com/uk/techdays/ ). Finally, here is a superfluous photo from my time at the MVP Conference – well post-conference actually. 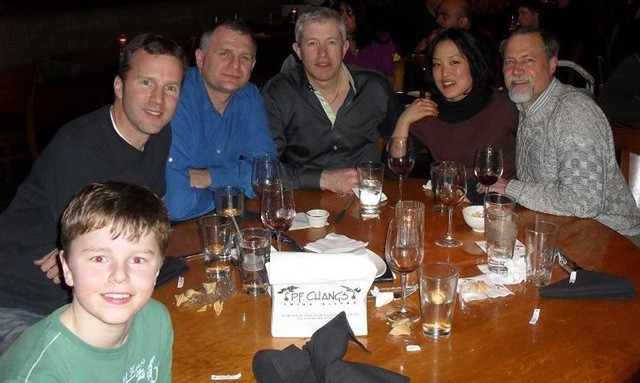 Left to right : Jonny and Richard Smith (Microsoft – thanks for the Nordic skiing), me, Michel LaPlane (MVP Visio in France), Lamie Kim (not an MVP from S.Korea), and Scott Helmers (Visio MVP USA) – all enjoying PFChang’s in Bellevue!